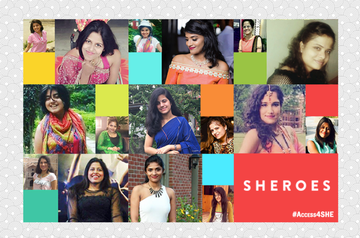 We have a buzzing fashion community on SHEROES - a space where creators and consumers of fashion come together to talk about trends, cool products and to showcase their own creations. Payal Kukreja, one of our most active community members, not only loves fashion but aspires to walk the ramp someday. Yet, as a woman with a disability, the everyday shopping experience is still a struggle and she posted a troubling incident in our Fashion Community, an eye-opener of the discrimination she has faced in the retail world. SHEROES has several community members with disabilities and Payal’s post led me to wonder - what are their fashion aspirations and challenges? To know more, I spoke to six amazing women with disabilities who are passionate about many things - poetry, travel, music and writing, and fashion! Payal Kukreja, 27, is a postgraduate from Delhi University, currently working at Metlife. A proud SHEROES community member, Payal’s a bold writer who never shies away from writing on topics considered taboo by our society - from sexuality and disability to slaying the ramp. In her free time, she loves listening to music, blogging and spending time with family and friends. Born with an orthopaedic disability, Payal uses a walking aid but aims to lead a full life, and this includes experiments with style. “For me, style is something which does not make me feel like an alien in my own skin. I like anything that I can carry off well and which makes me feel beautiful from the inside,” she shares. Does she believe designers pay enough attention to women with disabilities? Her response is a straight “No!”. “With an orthopaedic disability, it’s cumbersome to move one's body in a flexible manner and hence, difficult to wear certain kinds of clothes. For instance, a pair of jeans or churidar, since these are tight-fits,” explains Payal, who also points out a limitation in formal shirts. Buttoning a formal shirt is a struggle for some. “But I haven't seen any formal shirt which doesn't require buttoning, without interrupting the formal look of the outfit,” she observes. Another piece of essential clothing she finds complex to navigate is innerwear, a daily staple we hardly ever discuss. “I struggle to hook my bra because the hooks are usually at the back. Though I have tried ones with hooks in front, these don’t offer enough support for my breasts,” says Payal, who is forced to wait for her mother to bail her out, or else settle for a sports bra, which has straps too broad to be worn with regular clothing. An opinionated woman, Payal has strong views on what constitutes accessible fashion i.e fashion designed in a way that it is wearable by people with diverse needs, “For me, accessible fashion is fashion for every 'body'.” Well-said! It’s true that several body types are missing from the fashion industry’s canvas and while plus size fashion is being evangelised by models like Ashley Graham and our own transgender plus-size model Mona Campbell, the industry ’s focus on shorter adults and people with disabilities, in general, is completely missing. However, it’s not just fashion that’s the issue. Finding a good fit combined with functionality is a struggle and Payal is lucky to have found a designer in her mom. Be it Western or Ethnic wear, her mom gets it designed and stitched for her. “She makes clothes in such a way that it becomes easy for me to dress and undress without struggling too much. My next venture would be to wear a saree,” shares Payal, with excitement. Disability rights ambassador Malvika Iyer hits the nail on the head when she defines accessible fashion for her. “Even though I can ask for help, I always feel confident when I am able to wear things on my own,” says Malvika, who survived the impact of a dirty bomb that changed her life, forever. She lost her hands, and her legs were also badly injured in the accident. “For people who have hands, they might not think twice - they will pick a pair of jeans that fits them perfectly. But for me, I need to check if I can use the button on my own,” shares Malvika, who has had to take some practical decisions with regards to her wardrobe. For instance, from jeans, she has switched to ‘jeggings’, which have no buttons. She also does not wear salwars with strings, her mom replaces the strings with elastic and velcro. After she began using prosthetic arms, one key concern while shopping was whether the clothes would fit her prosthetics, as well as the rest of her body. However, this committed fashionista goes the distance to make it work. If she likes something and it does not fit her prosthetics, she buys the clothes, opens up the stitching and makes it fit. “I have spent a lot of money and time customising clothes to my needs,” shares Malvika who also struggles a little with her lower body. “My legs are greatly disfigured, they have nuts and bolts, and a lot of scars,” says Malvika, who has now reached a place where she can speak about these things, candidly. How does this affect her fashion agenda? Turns out Malvika can only wear sports shoes with a lot of cushioning and comfortable floaters, usually a size bigger. When shopping, she spends at least 30 minutes wearing a pair to make sure its a winner in terms of style and comfort. In fact, Malvika was the showstopper at a recent fashion show, and guess what she wore underneath that scintillating lehenga? Sneakers! One accessory she misses out on are rings. “I spent a lot of time feeling bad for myself in college and it really affected me. But now, I have come out of that and have stopped using prosthetic hands and it’s amazing to wear clothes I actually like,” shares Malvika, who has never let any practical setbacks rain on her inner fashionista. In many ways, her fashion identity is deeply influenced by her mother, a fashionable woman who supports Malvika in all her style adventures. “Ever since I was a young girl, I have always subscribed to fashion magazines, lived in the North and South and adapted to all cultures,” says Malvika, for whom it’s as important that clothes are good looking as they are accessible - that’s non-negotiable. “This season, I’m really into floral prints and palazzos,” shares Malvika who has an eye for picking up striking clothes that ‘look expensive’. Mixing up clothes from the streets and brands is her mantra. She’s worn lots of sarees, lehengas, long dresses, skirts, pants, loves black, as well as a unique combination - pink and orange! She’s also into statement necklaces, which showcase her defined collarbones. Malvika’s message to designers & brands: Keep both style and function in mind when creating clothes and accessories. Collaborate with occupational therapists who work a lot with people with disabilities to understand their needs. Wrinkle-free clothes really help. Accessible wear leads to independence and quality of life. In 2016, Jolly Mohan was greatly appreciated for writing a visceral piece on how inaccessible bathrooms have taken a toll on her physical health, career prospects, finances and general emotional well-being. Jolly stands out from the crowd wherever she goes because of how well she carries off anything she wears. Working with Bank of America, Jolly loves to party, meet people and most importantly, dress up like a diva! “I definitely have my own style which I have understood over the years as my body is changing due to certain medical conditions. To me, fashion does not mean the latest trend but how you match things and add clothes to your wardrobe, which enhances your body type and personality,” shares Jolly Mohan, with conviction. Pink and black are her favourite colours and predictably, her wardrobe is bursting with them! She also loves to flaunt gowns, the kind which flow from the waistline. “They really complement my petite body type,” shares Jolly. A fiercely independent woman, this streak reflects in her retail experiences too. “I shop by myself and am very particular about my clothes. I wear cuts and colours, which camouflage my shape due to wearing a spinal brace,” says Jolly, who often struggles to get the right size in the pattern of her choice. “Shopping for me is normally on impulse and never really planned,” she rounds up. The first thing that jumps out when you meet Shivangi Agrawal is her confidence. At a young age she ventured out of India, all by herself for further studies, and was encouraged by her parents to explore the world, and even drive, independently. A graduate in Psychology and Biocultural Anthropology, Shivangi moved back to Delhi after living in the US for six years. She identifies as queer and a radical femme, and currently works at the Sardar Patel School’s administrative department. Shivangi also struggles to find dresses and gowns for herself. “I've tried dresses that go down to the knee for ‘normal’ people but most times, they do not look good on me. The same is the case for Indian clothes, kurtas, churidar, and sarees,” says the fashionista, who now gets her sarees and Patiala pants custom-made from a tailor. Yet, the biggest disappointment for Shivangi is when it comes to shoes. “For shoes, I have no expectations. I get curious and weird looks when I walk into a shoe store when shopping for a friend or family,” says Shivangi, who wears orthopedically custom-designed footwear. All these myriad experiences have pushed Shivangi to minimise her shopping with fashion labels. “They are unwilling to even make their stores physically accessible for PWDs (People with disabilities),” Shivangi points out. However, she makes an exception for funky micro-brands leveraging platforms like Instagram and SHEROES to cultivate a loyal consumer base. This fashionista has also walked the ramp at fashion shows, where her experience has been great. “I wish I could do that full-time. Ha ha,”she says, playfully. Vinayana Khurana, a Master’s student at Delhi University, has lived with cerebral palsy since she was born, a condition which has impacted her speech and motor skills. Over the years, she started expressing herself through poetry and often with posts in our Poetry community. Additionally, she loves dancing, travelling and recently experienced her first trip to Goa. Once there, she went a little wild with her wardrobe, bringing out the funky jewellery, tank tops, skirts and hats. “I always like a scarf with my clothes,” says Vinayana. She also loves wearing dresses and gowns but faces some challenges when wearing them. “Gowns and long dresses should be designed in such a way that they do not get caught up in the wheel of my wheelchair. This is what accessible or adaptive fashion really means to me,” she explains. Shopping for Vinayana mostly happens at malls, which tend to be more accessible to wheelchair users, since they have lifts, accessible bathrooms and ramps. "Some trial rooms are large and accomodate my wheelchair, but not all trial rooms are accessible. But shop assistants are usually good and show me my favourite clothing without hesitation, " she shares. For go-to comfort, Vinayana likes casual pants and shirts. "I only buy dresses I love at first sight!” she says, with a twinkle in her eyes. Our last diva is Divya Sharma, 25, who lives in Naya Nangal Punjab. A senior content writer at a web development and SEO company, and a content manager with online radio station ‘Radio Udaan’ (started and run by visually challenged people), she’s also a disability activist, a motivational speaker, a guitarist and a contributor to magazines and newspapers. Additionally, Divya has a blue belt in karate and is gunning for black, soon! With a 75% visual impairment, Divya ‘reads’ by listening to screen readers. As a child, she attended a mainstream school along with her twin sister Kavya up to Class 7, after which she was asked to leave the school and denied admission by all other schools in the area. But with her family’s encouragement, she finished Class 10 as a private candidate and scored 80% marks. She completed the rest of her studies via correspondence and earned a Master’s in English from Panjab University. During graduation and post-grad, she worked hard on her technology skills, and also learned about JAWS and other screen readers. Understated elegance works for her and comfort is an absolute must. “I feel I can look beautiful, only if I am confident in the dress I am wearing,” she observes. Her picks are tee-shirts, shirts, tops, coats, jeans and occasionally sarees and dresses. Divya’s idea of accessible fashion is very specific. “The dresses should have limited buttons so that it does not get challenging to manage them - the lesser the buttons the better. Also, it would be great if the colours used in designer dresses are decent,” she shares. Divya’s idea of what constitutes decent is very specific, too. Living with a 75% visual impairment means that Divya’s eyes respond differently to bling. Shopping buddies comprise her twin Kavya or mom, and she tends to shop on a need-only basis. “But this does not mean I don’t have a good collection, I do, and spend generously on dresses, shoes and accessories, if it really catches my interest, though I avoid pencil heels,” Divya clarifies. Divya's message for designers & brands: Divya feels like there is almost zero enthusiasm among designers and brands, to dress up women with disabilities. “We women with disabilities desire to wear attractive, elegant, beautiful dresses. Fashion houses don’t lack innovation, creativity or skills - just awareness. Once they know us (women with disabilities) better, they would definitely come up with excellent outfits for our wardrobes,” she rounds up with absolute conviction. After speaking to all of these amazing women about their fashion aspirations, I did an Internet search for ‘Accessible Fashion in India’. The results sadly had no relevance to this conversation. Instead, affordable fashion was confused with accessible fashion, which indicates the lack of awareness about this aspect, completely. While international and Indian designers have featured women with disabilities as showstoppers in their fashion shows, such statements have not translated into meaningful actions on-ground. Having said that, there is some positive movement in the FMCG space. According to Kalyani Khona, Founder of matchmaking platform Inclov, for people with disabilities, retail chain Big Bazaar has started making its stores accessible and has a national roadmap for this endeavour. “Amazed and excited to know that you treat every consumer equally!” she wrote on her social media timeline, recently. “One shouldn't be deprived of wearing something just due to bodily limitations. A little amendment in clothes is a great virtue for people with disabilities,” says Payal, and she's absolutely right. Awareness and committment to solve problems in a creative way, can make a world of difference to the quality of life of the over 1.8 crore women with disabilities who reside in India. Hopefully, this article will be a call to the makers, marketers and distributors of fashion to pay close attention to the millions of women with disabilities who are also consumers. These women want you to listen, with the hope that their aspirations will have a voice in your brands. All are must be belongs to financially good family.. Otherwise there are many physically challenged people around as well who have intelligence but don't have guidance and money to explore that.. Success literally needs support other than dedication... .just confirm, are they financially settled? Wow...you All are an inspiration to uz. Thanks Manisha, always good to have a positive review from an image consultant! Thanks Deepti for spreading the word. Your support always makes an impact! Such pretty and confident girls. Merril, this is a wonderful article! Thank You for lending a voice to this very relevant topic which is very often ignored. Thank you, also for introducing us to Payal, Malavika, Shivangi, Jolly, Vinaya and Divya. Each one of them has their own Personal Style and their courage and passion are awe inspiring! What Are The Most Popular Fashion Designing Courses In India?